Handicap tubs provide the elderly and the handicapped, a safe alternative to showering. Taking a warm bath can soothe and relax all the body’s muscles. For the elderly or disabled, moving around can be quite difficult; everything from walking down stairs to using the bathroom can be a chore. However, if you are handicapped, then you know that being able to take a shower without help is important. This way, you can keep your independence and dignity. This is where a handicap shower tub can come in handy. The following are just some of the benefits of investing in handicap shower tubs. A handicap shower tub is designed to make it easy for the elderly and disabled to shower. Often, these tubs are designed to make it easy to get such a person into the tub. 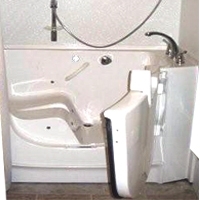 Handicap tubs include shower grab bars and handles to make it much safer for a handicapped person to use. These tubs are important because they allow a person to shower in a safe manner. Handicap tubs have a strong side door and lock that prevents water leaks and keeps your bathroom dry but is still easy to open and close. These shower tubs are just as sturdy as traditional tubs and also has mildew and flame resistance. Since the handicap shower curb is low to the ground, this reduces the chances of slipping, when the user is entering and exiting the bathtub. To further reduce this risk, you can add optional anti-slip shower mats inside and outside the tub. Lying in a tub full of water is relaxing and is capable of rejuvenating and reliving anyone with muscle aches and arthritis. Bath therapy added with sea or Epsom salts have been shown to provide muscular healing. Traditional tubs are hard to get into because they are often high and neglect those with balance and motor coordination difficulties. Every time you get in and out of a tub, that is a potential safety hazard. A handicap tub can be entered and exited with the opening and closing of a door. Some tubs are equipped with a bathtub lift that allows someone to sit on a transfer area and slide themselves into position. Once they are in that comfortable position, they can be lowered into the bathtub. With the right handicap shower tub, a person can shower easily. And of course, the easier it is to shower, the happier a person will be. Often, the right handicap shower tub can greatly improve a person’s quality of life. Don’t think that you have to break the bank on this investment. Some insurance plans will not only pay for shower accessible ramps for a home but also for some of the costs of a handicap tub. This depends on the grants and disability funded programs. Thus, a person can lead a full and fulfilling life even if their mobility isn’t what it used to be. When you are handicapped, the little things matter the most. Being able to shower, without a fear of falling or taking hours to get in and out of the tub, make all the difference.